Paige CRAFTS! 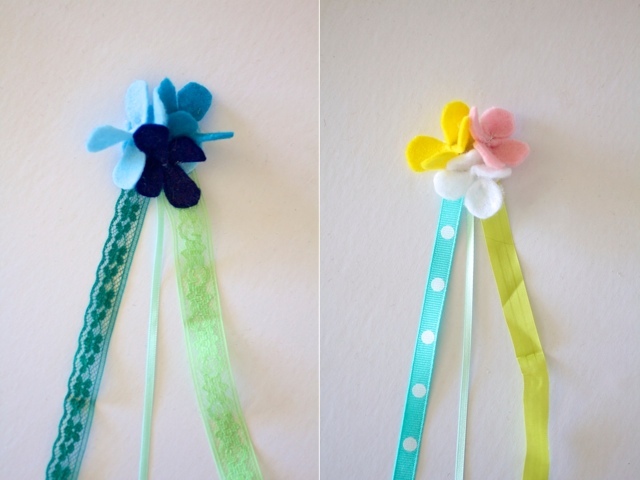 #5 Floral Bookmarks! "Hello, this is Paige! 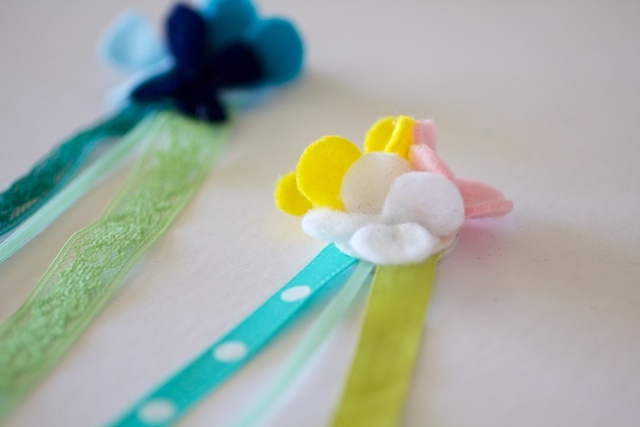 How I made these bookmarks is, like, first you choose some fabric (ribbon) and then you...hmm, let's see...cut out circles and after those circles you fold them and you get a glue gun and put them on the fabric (ribbon) and in the middle you put glue in the flower and then put in the bead you want. 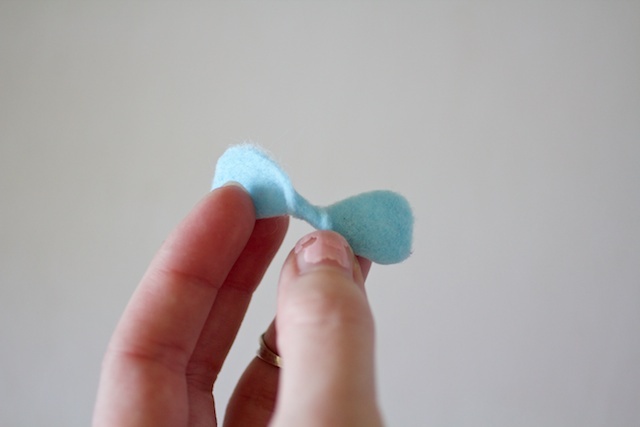 When you're done, get some felt and then whoever you want to give it to, put their initials on it and then you give it to the person. I gave them to Vicky and Roxane and Elly, the librarians. They are librarians. To be nice. They were surprised! I like them because they're good friends. They always be nice to me. One time with daddy she gave me a prize thing without me even winning it! I got a free ticket to go to taco time and they gave me some chocolate kisses, but I couldn't eat them. And she gives hugs, but she doesn't usually give kisses. I just found out what Roxane loves: fairies. Bye-bye! 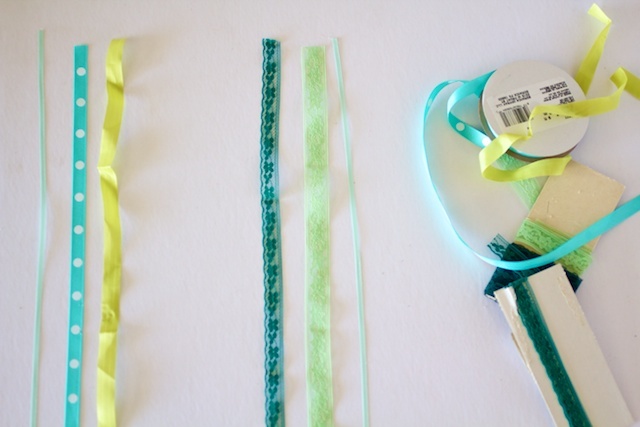 Love, Paige"
Cut three different kinds of green ribbon or trim long to about 3'' longer than your book. 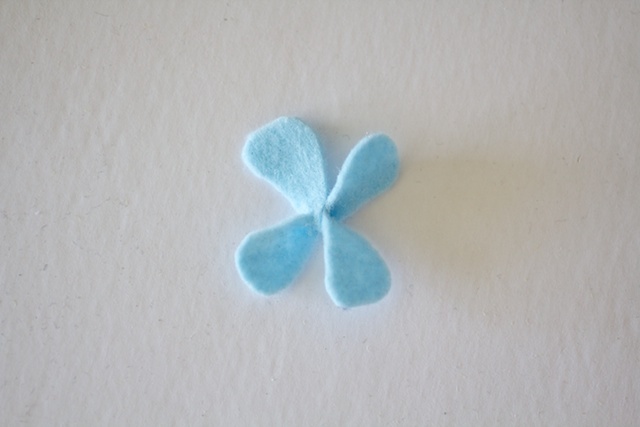 Then cut two small, felt petal shapes on the fold for each flower. 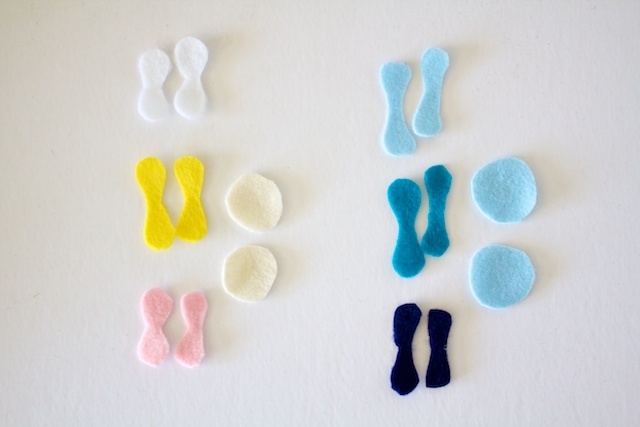 You'll also need two small felt circles (about the size of a half-dollar) for each bookmark. 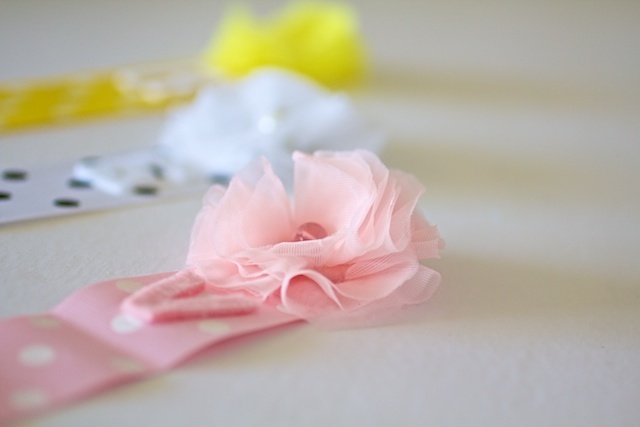 Twist each petal piece twice with a tiny dab of hot glue to hold the twist in place. 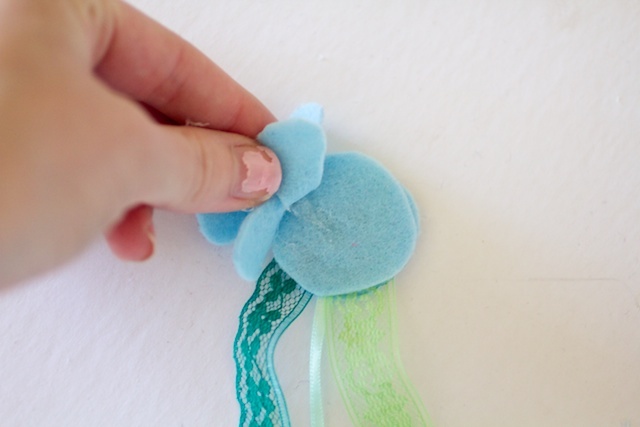 Then glue one petal piece onto the other. Repeat for all flowers. 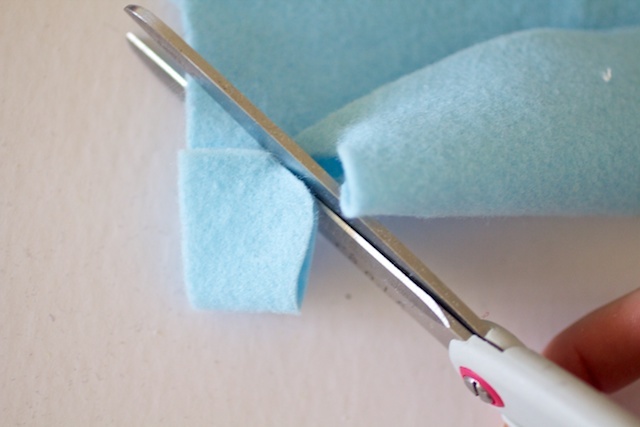 Glue the top of each piece of ribbon to one of the felt circles. Glue the other circle on top. Glue all three flowers to the top of the circle. Here is Paige with two of her library-ladies. They really are such, sweet, special women. I have to admit, a big part of the reason I take Paige to the library so often is because of them. They are always so upbeat and caring! This is random, but when I was little it my absolute dream to be a librarian. (Have I told you this story before?) 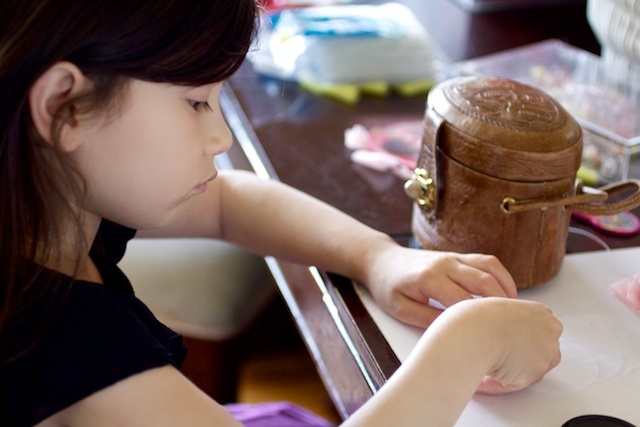 My sister and I used to sit in our room with piles of books and a hairbrush (as a "stamp" to stamp the due date...remember stamped due dates?!?) to check books out to each other. It was one of my favorite things to play! P.S. As always, feel free to leave a comment for Paige, she loves reading them! Paige, your bookmarks are very cute. I can't wait to see what craft you make next. Lately I've been reading e-books and this makes me miss paper editions so very much. I'm French and I live in France (but I check your mum's blog every day and I love reading her articles) and I think you made really beautiful bookmarks. Thank you for teaching us such a pretty craft. 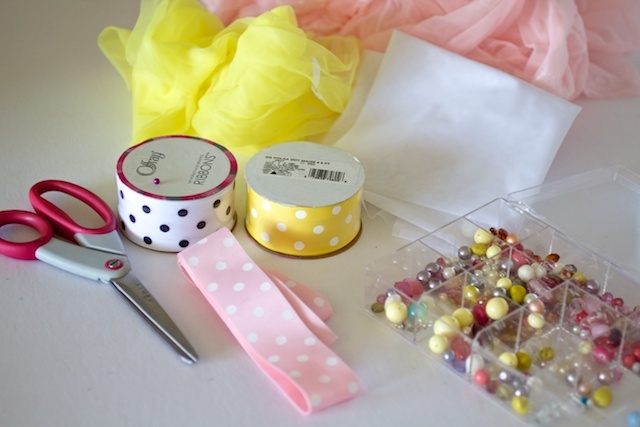 I can't wait to make 1 or 2 or many! :-) also, it was very nice that you shares it with your friends, so nice of you. Can't wait for the next craft! Your crafts are always delightful. You definitely inherited a lot of creativity from your mom. 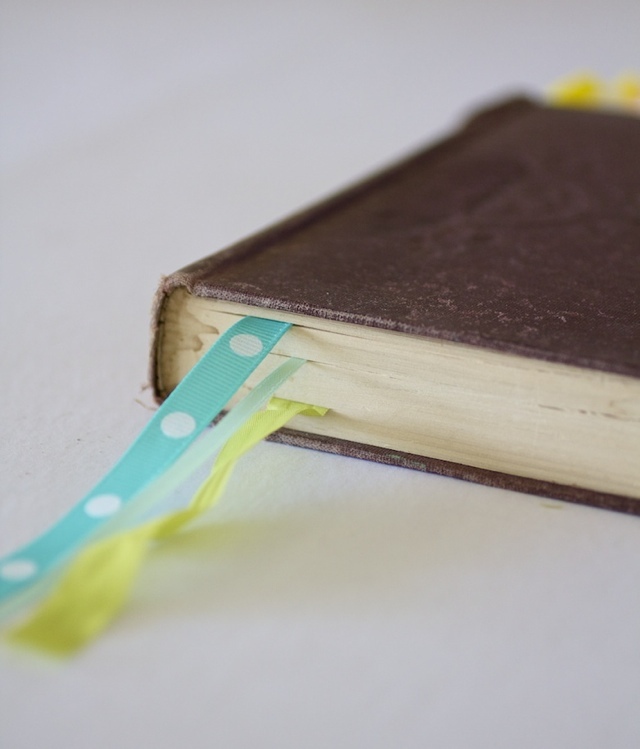 The bookmarks you made are beautiful. I think that any person would have been thrilled to receive them as a gift - and it was so thoughtful of you to go give them to your local librarians! I think I am going to have to make some Paige-inspired bookmarks now for my own "library." Looking forward to seeing what you create next! Good job Paige, these bookmarks are so cute! Paige, your bookmarks are beautiful. It was so nice of you to make bookmarks for the librarians. You are so thoughtful. paige did a really good job!! they are really pretty and what a sweet thing to do! and i loved playing 'library' when i was little. i even numbered my books with a sharpie marker! lol i also loved playing 'airport' and 'grocery store' lol i had a great imagination!!! 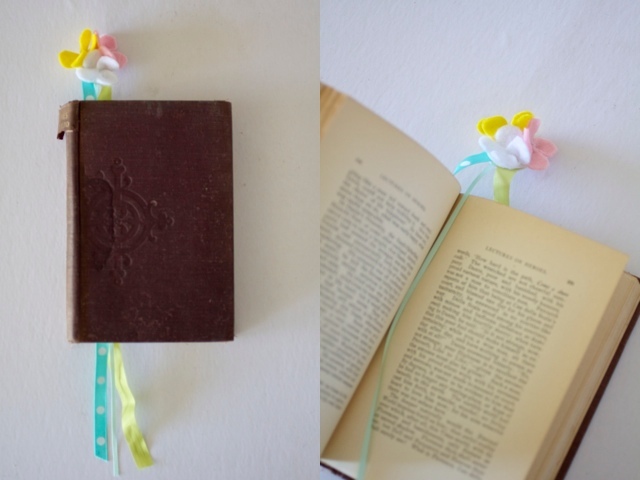 Beautiful bookmarks. It is so nice to have great librarians! My girls love ours too. Thanks for sharing! 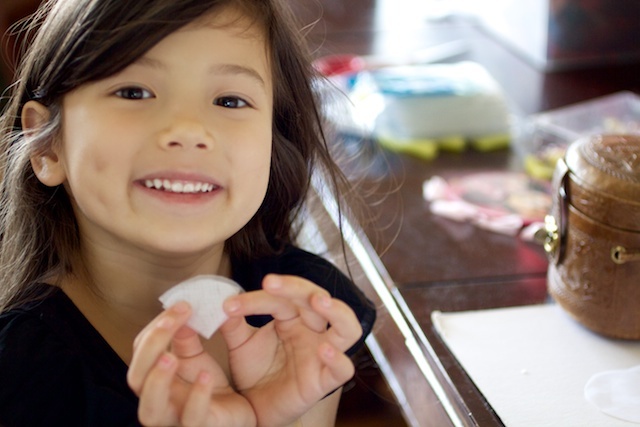 Show her this fun idea and she will absolutely love making these! 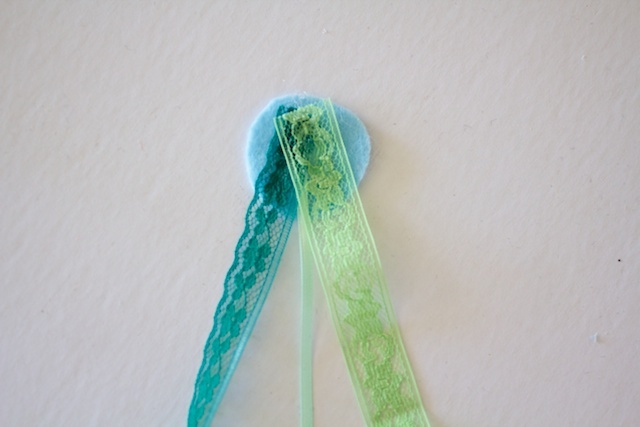 Paige, your bookmarks are so beautiful! And it makes me even happier that you wanted to use your gifts to bless others! Side note to your Mom: I use to play library with my sister too. We'd use my mom's old credit cards as "library cards". Paige, you and your Mom are just the sweetest people. The bookmarks you made are lovely. I bet the librarians were so happy to receive them. Thank you for sharing your craft with us! 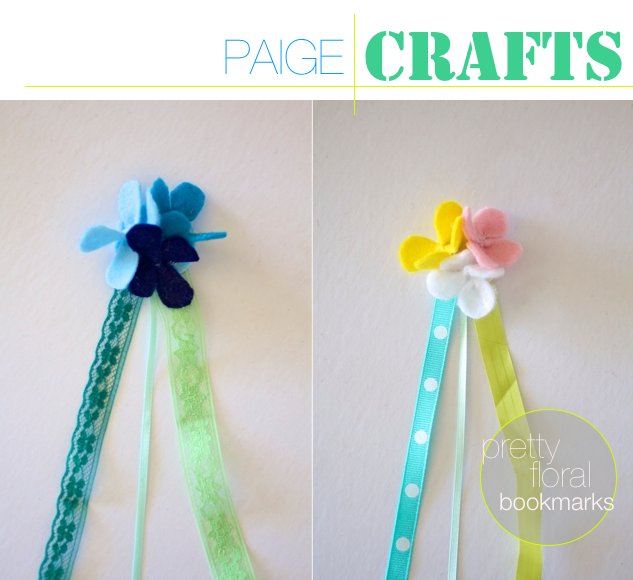 Paige, your bookmarks are so pretty! Hi, Paige! Just want you to know that I love this idea! How smart and creative of you. But, mostly, I am touched with what a thoughtful young lady you are! God bless you! Hi Paige! I sent this to my friend who is working at the Quaker Yearly Meeting. This is great! Very sweet! 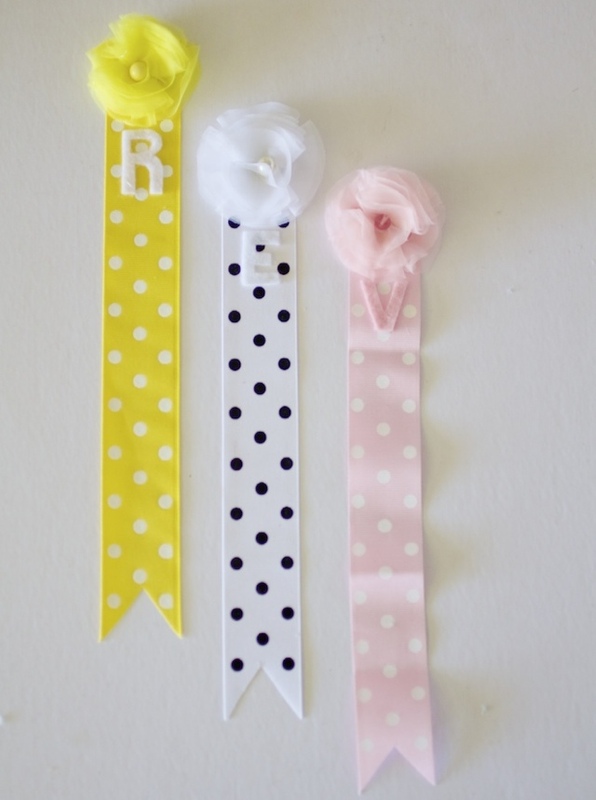 I especially love the three strand bookmarks. Great for marking multiple places in your book! 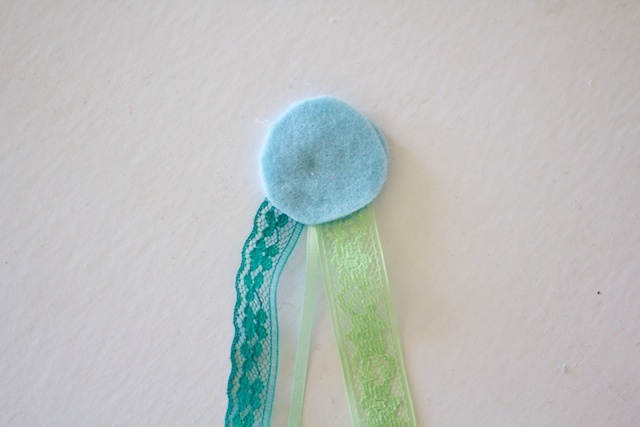 Thank you very much fo the great bookmark idea! 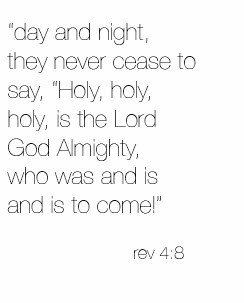 Sometimes I want to mark more than one place in my Bible and now I know who I can accomplish that. I can hardly wait to make one. I'm Elisabeth, librarian from Dresden, Germany and I really like the things you (and your mum) craft! 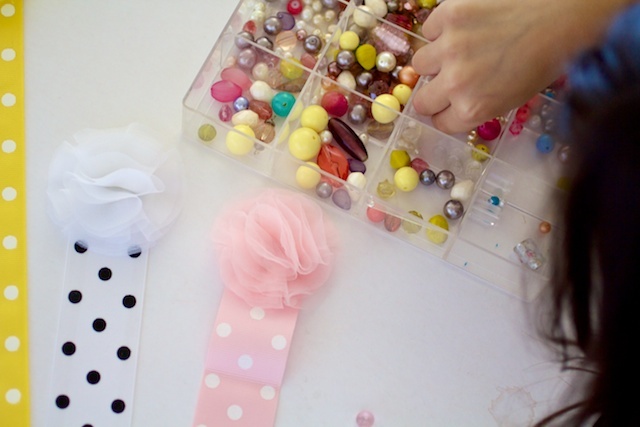 A really sweet idea to craft something for your library ladies, I can imagine how they were pleased for receiving such a sweet gift, because I would feel the same if someone brings something with love hand crafted to our library. By the way, librarians seem to have the same names all over the world - my boss and me are called Elisabeth and a dear colleague who has former worked at my position was called Roxana. Small world! So, carry on reading (in libraries) and crafting (but don't forget showing us!)!! Paige, you really are a clever and very kind little poppet. When they're a bit older my sons will really like trying out your ideas. Thankyou for taking the time to show them to us. Hey there Paige!! I LOVE your craft! It is suuuper cute and can´t wait to try it out. I´ll be waiting for your next project, ok? bye bye sweety. Love this craft work by you. I would certainly make some with my daughter Aarotrika, who is 5 yrs old. WOULD LOOK FORWARD TO NEW CRAFT FROM YOU. GOD BLESS YOU. you're not the only one...i still dream of being a librarian --- specifically to be a librarian in a small english town, and live in an old stone cottage with roses rambling across the roof.....oh, to dream! Brilliant idea Paige! I will be trying this! I love reading your Paige Craft's = they are always great! Thank you! Thank you for the fabulous idea! I think it's great, and I will be making some of these! I love your Paige Crafts series, they are always great to read!